CAPE CANAVERAL, Fla. — An Orbital ATK Pegasus XL air-launched rocket will send the Cyclone Global Navigation Satellite System (CYGNSS), a set of eight microsatellites, into orbit at 8:19 a.m. EST (13:19 GMT) Dec. 12, 2016, off the coast from Cape Canaveral Air Force Station. The satellites will use GPS signals both to determine their location and to observe tropical cyclones. 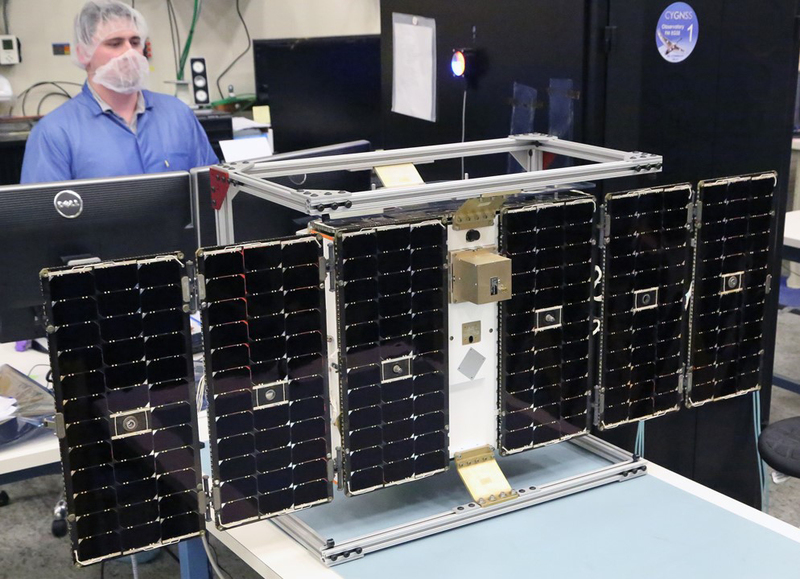 The primary instrument aboard CYGNSS will be the Delay Doppler Mapping Instrument (DDMI), which will use a GPS receiver and antennas to provide imagery of tropical cyclone wind fields with high temporal resolution as they form, intensify, and decay. The GPS receiver will perform its standard navigation and timing functions while also providing digital signal processing. This processing will generate maps of GPS signals reflected from the ocean surface. Theses maps are called Delay Doppler Maps (DDMs). The DDMI can capture four DDMs simultaneously. The mission will study the relationship between ocean surface properties, the thermal interactions of moist tropical air, radiation, and atmospheric convection behavior to determine how tropical cyclones form, whether they will strengthen and, if so, by how much. This will advance cyclone forecasting and tracking methods. CYGNSS data will enable scientists to probe how the atmosphere and the oceans interact near the inner core of these storms. Those interactions change rapidly and play large roles in how tropical cyclones form and intensify. The primary science objectives will be to measure ocean surface wind speeds in all precipitating conditions, including those experienced in tropical cyclone eye walls, and to measure ocean surface wind speed in the cyclone’s inner core with sufficient frequency to observe its formation and intensification. Secondary science objectives include supporting the operational hurricane forecast community by producing and providing ocean surface wind speed data products. CYGNSS also will help cyclone forecasters assess the value of these products for use in the future. CYGNSS was built under NASA’s Venture Class science program, which is dedicated to producing science-driven, competitively selected, low-cost missions that enhance the agency’s capability to better understand the current and future state of Earth’s climate. The mission fits under the lower-cost umbrella by using eight microsatellites instead of one larger satellite to collect data. Each observatory will use less than 50 watts of power and weighs less than 44 pounds (20 kilograms). In orbit, after each satellite deploys its solar panels, it will reach “the size of a full-grown swan”. Flying eight satellites over the tropics (35 degrees north and south of the Equator) instead of one also allows for more real-time coverage of active storms. As of Friday morning (Dec. 9), predicted launch conditions on the Florida coast declined from 70 percent favorable to 40 percent favorable. NASA’s Kennedy Space Center will host a Facebook Live event at noon (17:00 GMT) Saturday from the Skid Strip runway at nearby Cape Canaveral Air Force Station. The event will stream live on KSC’s Facebook page. NASA has not indicated when the next launch opportunity will be if weather conditions prevent a launch on Monday. Managers from NASA and Orbital ATK will hold a final Launch Readiness Review Saturday morning, followed by two news conferences. The Prelaunch News Conference will be at 1 p.m. EST (18:00 GMT), followed by the CYGNSS Mission Science Briefing at 1:45 p.m EST (18:45 GMT). With weather the chief concern which could prevent Monday’s launch, SpaceFlight Insider asked what determined that CYGNSS would be launched from Cape Canaveral Air Force Station. “Vandenberg is basically too high of an inclination for us and we could have gone out of Kwajalein (Atoll), actually I was on a Pegasus mission that launched out of Kwajalein, but it’s much more expensive to launch out of Kwajalein, it’s out in the middle of nowhere, so it’s a lot more convenient to come out of the Cape and it gets us to the orbit that we need, which is the 35-degree inclination,” CYGNSS Program Manager, John Scherrer told SpaceFlight Insider during the pre-launch press conference held on Dec. 10. 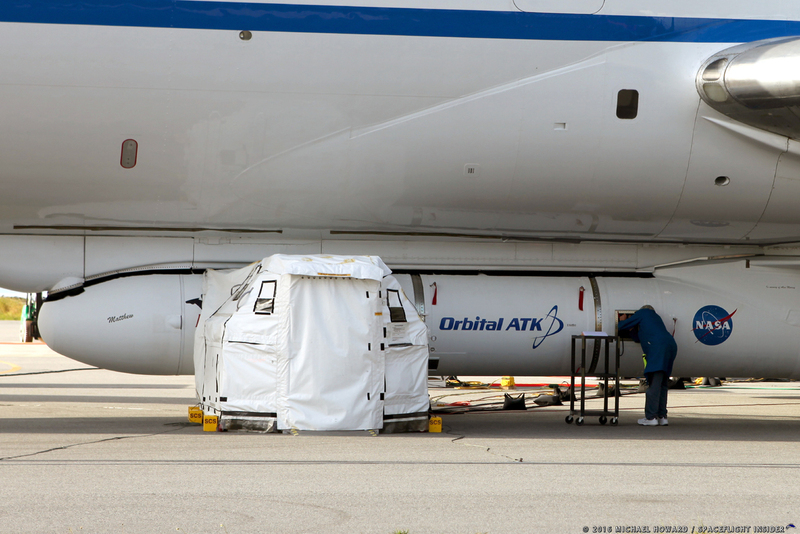 CYGNSS is unique among this year’s (2016) missions in that it will be air-launched from Orbital ATK’s L-1011, an aircraft whose airframe was constructed in 1972. The L-1011 has a proven history in terms of its role as a carrier aircraft for the Pegasus family of launch vehicles. “It’s a very capable aircraft and we’ve been on a number of missions with it, we’ve launched for the government of Spain, as mentioned, we’ve been to Kwaj (Kwajalein) […] we’ve launched out of Wallops, we’ve launched here from the Cape and also at Vandenberg, so it’s a very flexible vehicle and has good range and it’s been a great asset for us,” Baldwin told SpaceFlight Insider.